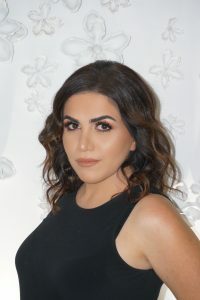 With talents that stream back more than 15 years, prodigy brow artist, Lynette Nersisian, realized her God sent gift for eyebrow threading and deep passion for beautifying at the mere young age of just 16. Over the years, Lynette’s professional experience gained her valuable recognition within the beauty industry, especially that within the eyebrow-shaping community. From a unique talent to a deep passion, Lynette never dreamt that her love for beauty would ever become her career of choice. Her educational background includes a bachelors degree in computer engineering and business administration, widely a far from anything she is currently practicing right now. But it is true what they say, do what you love and you’ll never work a day in your life. And that, she did. Lynette’s passion began brewing at a much early age. While being just a young girl, she recalls the little things that made her smile, like the moments when she would pick up a paint brush or lift a pencil to paint or sketch art, which ultimately invited beauty and aesthetics into her life. From the art, came the beauty. Lynette had an eye for illustrating faces and paid close attention to the way eyebrows would shape and frame the face. It was from the point that she learned the beauty and strength behind a beautifully shaped eyebrow. Lynette has since believed that human faces are pure art and made it a goal in her life, and ultimately which led to her career, to bring this art and now one may call, her speciality, to life. With this speciality, with this art, Lynette transforms the frames of unique and individual faces every single day. In addition to being a highly skilled brow specialist, Lynette also unites her knowledge of makeup artistry to educate how certain products can enhance the appearance and shape of one’s brows. Her experience in training as a makeup artist allowed her to work with many notable artists in the industry and create some of the most sought-out brow shapes in the community.